A pair of newly released polls conducted in Russia and Ukraine reveals that most in both countries favor the free movement of people and goods between the two nations, and relatively few support the wholesale merger of Ukraine with Russia. The current crisis in Ukraine traces its roots back to the question of whether Ukraine should align more closely with the EU or Russia. The two surveys were conducted before pro-Russian troops seized control of Crimea. The Ukrainian poll was fielded February 8-18 by the Ilko Kucheriv Democratic Initiatives Foundation, together with the Kyiv International Institute of Sociology, and the Russian poll was conducted February 21-25 by the Levada Center. The reported margin of error for the Democratic Initiatives survey is 2.2%, compared with 3.4% for the Levada survey. Clear majorities in Ukraine (68%) and Russia (59%) favor open borders between the countries. In Ukraine, this is the prevailing view not only in regions where Russian-speakers predominate, such as the East (72%) and South (64%), but in regions overwhelmingly populated by ethnic Ukrainians, such as the West (67%). Even among Ukrainians who want to join the EU, a 63%-majority back the free movement of goods and people between Ukraine and Russia. However, open borders is not the same as no borders. 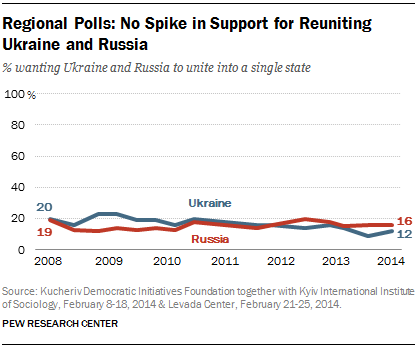 Fewer than one-in-five Ukrainians (12%) and Russians (16%) think the two countries should unite as a single state. Those living in Ukraine’s East (26%) and South (19%) are somewhat more enthusiastic about the idea of reuniting Ukraine and Russia, but support falls to the single digits in the country’s Center (5%) and West (1%). Similarly, a 32%-minority of Russian-speakers think the two countries should merge, compared with just 9% among Ukrainian-speakers. At least in the days leading up to Viktor Yanukovych’s removal from office, events in Ukraine had yet to boost enthusiasm for a single Ukrainian-Russian state. In both countries, support for a unified state has remained relatively flat over the past six years. In 2008, 20% of Ukrainians backed such a move, compared with 12% today. In Russia, attitudes have changed even less: in 2008, 19% backed reunification vs. 16% today.